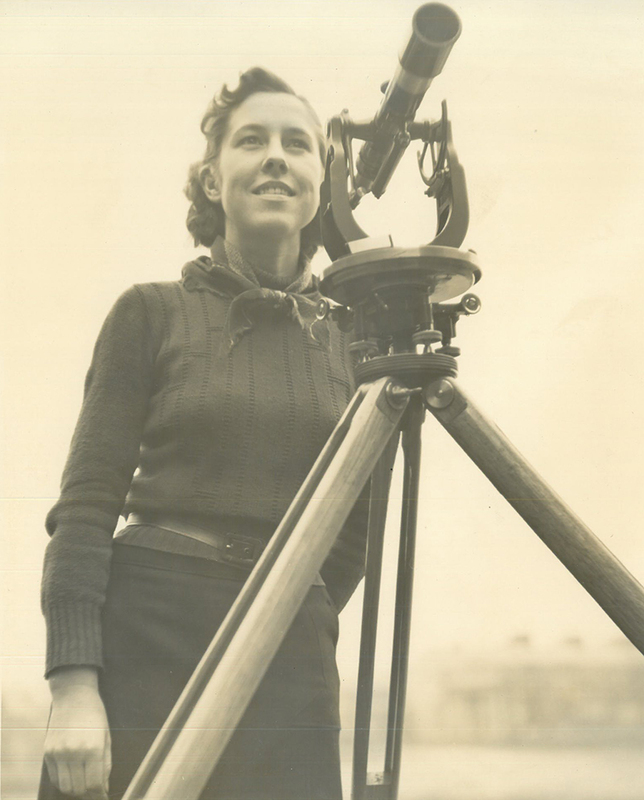 She may have also been the first woman in Tau Beta Phi, the national engineering honor society, and the first woman to be president of the WVU student chapter of the American Society of Civil Engineers, possibly the first such female chapter president in the US. The article also discusses her dreams, praise from faculty, her thoughts on fashion, and contains examples of the kind of sexism you would expect in such an article from the 1930s. According to the clippings, she hoped to build bridges or roads, enjoyed bright colors and accessories with a bit of red in them, thought that “classes without mathematics seem terribly drab,” and she wanted to have a family (with one draft article saying she wanted 12 children). Women in STEM and women balancing family and work life are still important topics that we grapple with today. After reading about her, I really wanted to see Esther succeed. I wanted to know what she did with her life, but since this collection of papers isn’t about her, I had to look elsewhere for the rest of her story. First, I turned to trusty vital records. Through the WV Vital Research Records Project, I learned that Esther married Norman Walter in 1940. Using Ancestry (WVU students, staff, and faculty have access to this thanks to the library, and community members can access it in the WVRHC), I found out that Esther was born in 1916 and died in 1997 in Putnam County, WV. 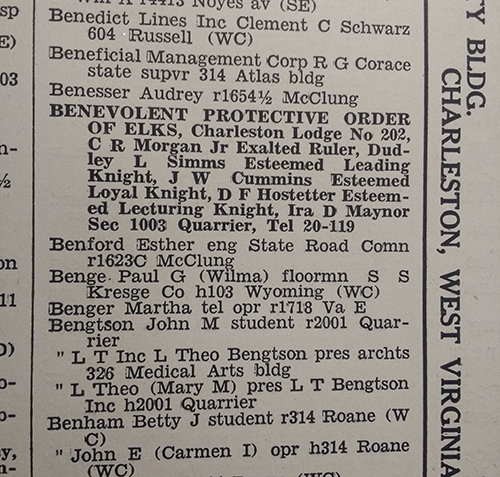 The 1938, 1940, and 1942 directories for the Charleston area list her under her maiden name as working for the State Road Commission, rising from draftsman to engineer. You can see her name in the 1942 directory below. By the 1946 directory, she is listed as Esther B. Walter, married to Norman, and no occupation is listed. I am not sure what became of her after that, but I’d like to think that our Esther and her Norman are the same people who set aside property to become the Esther & Norman Walter Memorial Nature Trail in Putnam County in 2015. According to an article from the Charleston Gazette, “Blazing a new nature trail,” Esther Walter was a bridge engineer for the West Virginia Division of Highways and had two daughters. 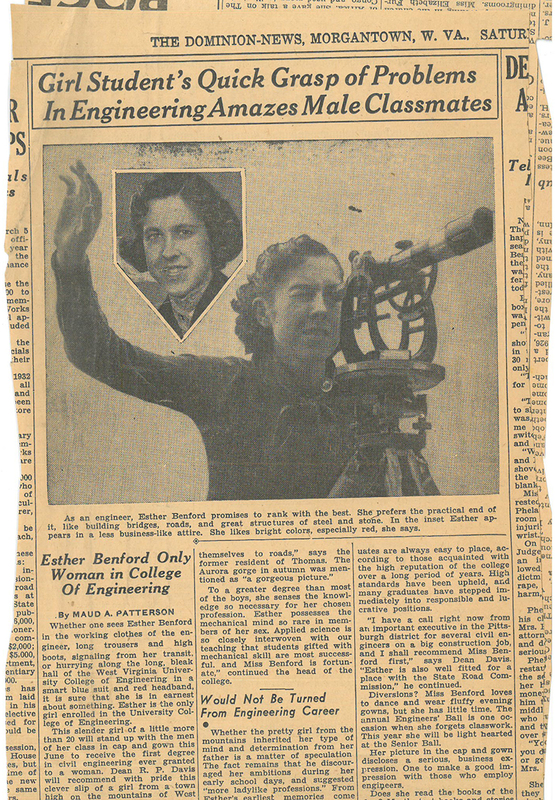 If I’m right and that Esther Walter is the same person as the Esther Benford who amazed her male classmates with her calculus skills in 1937, then I’m happy she was able to achieve her dreams.